The Todt had already made its appearance in Italy before the armistice of 8 September 1943. At the outset its task was to repair and maintain railway lines and associatied infrastructures, which had been heavily attacked by the Allied air forces. As from September 1943 its function was widened to include the building of fortifications and in general, everything without which the Wehrmacht could not operate (bridges, roads, airports, etc). Recruitment was carried out as follows. In every city a recruitment office was set up, run by personnel from the Sauckel Organisation, the Paladino Organisation and the Todt Organisation. The unemployed were required to report to this office and they were asked if their intention was to work in Germany or in Italy. In the event that they accepted work in Germany they were handed over to the Sauckel, if they declined they were handed over to the Todt or the Paladino. Those firms working in Italy for the Todt or the Paladino had in turn to apply to the recruitment office for the manpower they needed. In the autumn of 1943 the prioirity as far as the Germans were concerned was to sign on workers for the construction of the Gustav Line, which was to be built as speedily as possbile in order to delay the Allied advance. Hence efforts to obtain a sufficent number of workers were concentrated in central Italy. Despite the propaganda and the numerous appeals signed personally by Kesselring, the number of labourers who reported to the recruitment offices was well below that projected. 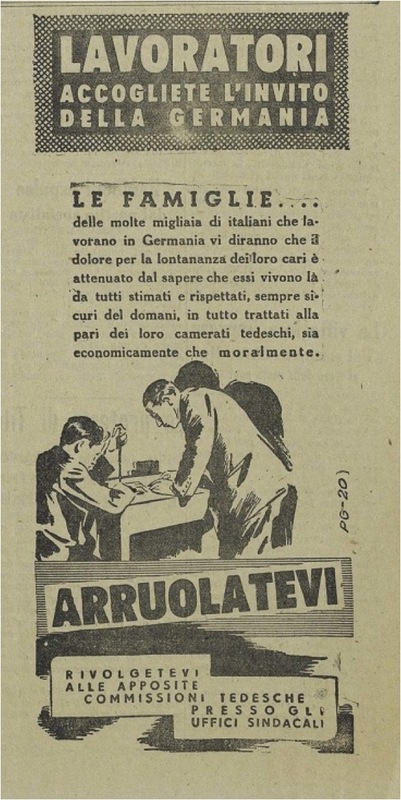 In the autumnof 1943 the situation of generalised chaos and the superimposition of requests coming from the competent authorities (the Wehrmacht, the Todt and the Paladino) rendered the announcements encouraging voluntary enlistment practically useless. This refusal was also clear to the German authorities at the time. 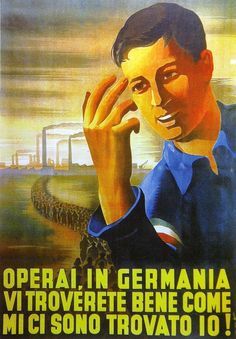 On 29 November 1943, at a meeting in Rome, the consul general Mollhausen began violently attacking the Italian directors of the Labour Service: “The consul general Muhlausen [sic] notes that it is not currently possible to talk of a German-Italian alliance given that German soldiers were fighting on the front in the South of Italy and young Italians were literally doing nothing".7 The meeting ended with the proposal to withdraw the ration books from families of those who had not reported to enlist. Along with this repression, the German authorities greatly increased their propaganda effort, through newspapers, leaflets and cars with loudspeakers. A woman whose function was to try to convince the workers to enlist was made to sit next to the car driver. On 28 October, the twentieth anniversary of the “March on Rome”, the Government of the Republic issued an amnesty for draft dodgers. It was the second act of clemency following on from the first which had been issued in May 1944 promising clemency to the draft dodgers, who had been previously threatened with the death penalty in an announcement of 18 February 1944. Through these measures it was hoped to recruit enough workers to meet German labour requirements. The statistics produced by the Home Office give a fairly complete picture as to the number of workers employed by the Todt Organisation. 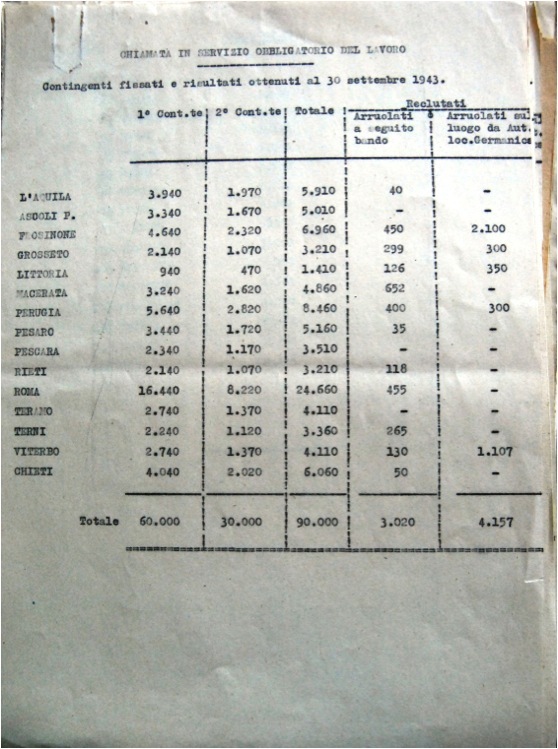 In July 1944 in the Province of Brescia there were 6, 559 workers on the payroll of the Todt , 6,640 on that of the German military and 441 on that of the Paladino. In Milan, up to 15 May 1944, the Todt had employed around 20,000 workers, and 2,500 had been sent to Germany. In Pavia, on 12 October, there were 423 men working for the Todt. In Aosta, in September 1944, there were 151. In Ferrara, at the end of August 1944, there were 4,611. In Cremona, the workers controlled by the Todt amounted to 2,037 employed in agriculture and 2,336 in industry. 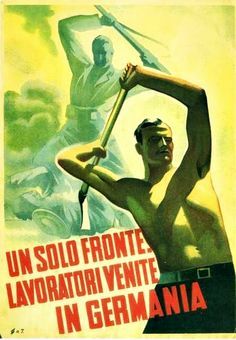 In Cuneo, 2, 400 were employed by the Bauleitung Saluzzi Lagnasco company, 200 in the airfields at Mondovì and 52 in a firm called Levaldigi Savigliano. In Genoa the workforce numbered 15,000, spread out in a hundred or so firms. The methods used by the Todt to get sufficient workers and to pay firms were quite casual. 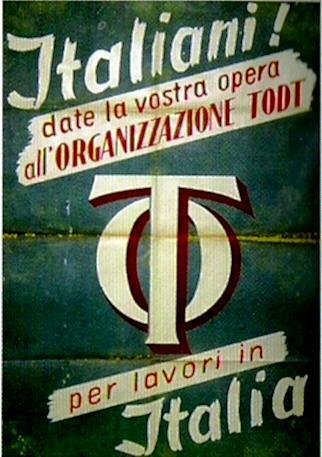 According to a report by the prefect of Lucca, dated February 1944: “The OT (Todt Organisation) entrusts the work to various companies using the “regia” system, that is the reimbursement of all expenses incurred for the workers, increased by 40% to cover taxes, administrative costs and profits. This avoids accounting and supervision. It is clear that with such a system everything depends on the honesty and conscientiousness of enterprises. One of these firms said: "The German Military Command indicates the work to be undertaken and the Todt Organisation passes the work over to the Italian companies, with whom they deal directly. The German companies pay the Italian companies directly. "14 The report continued by saying that the Todt had taken recruits of all types, including those characters who were not real workers but had taken advantage of the opportunity to avoid military service, and this in spite of the warnings and protests of the Italian local authorities. The Todt also lured workers with high wages. According to the Head of the Province of Sondrio, the labourers employed in excavation work on the mountain passes of the Stelvio and the Tonale were earning up to a thousand lire a day. Often, too, the Organization's engineers paid with bundles of a thousand freshly minted bank notes. The local military commands often used to take initiatives that were directly contrary to the laws of RSI. In December 1944, in the Cuneo area, an officer of the Wehrmacht issued a leaflet promising the partisans (including deserters) that if they reported for work they would be employed in Italy without any action being taken against them.16 Attached to the leaflet was a permit which said: “Those who hand over their weapons to the nearest Italo-German command post will be able to return to their homes and take up work in Italy. The Italo-Germanic Command has established a partnership with the Italian Government and will provide protection and a free passage to all those who report in and hand over their weapons." 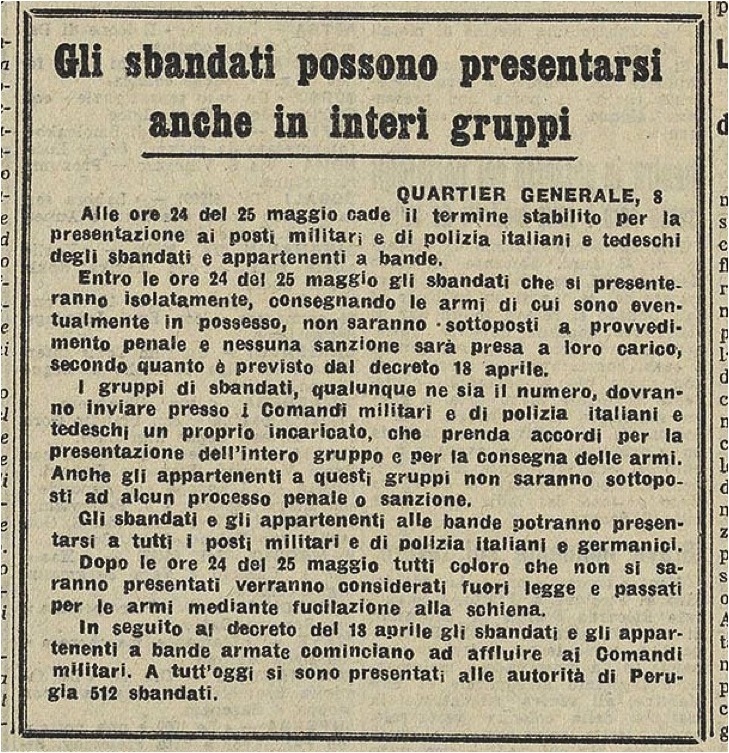 The same thing happened in the Piave area, where in December 1944 the German headquarters posted a manifesto which stated that soldiers in the republican army could also safely abandon their units and enlist in the Todt. Colonel Bocca, Graziani's chief of staff, had to intervene to make clear to the German officers that deserters were not covered by the amnesty which had been issued by Mussolini on 28 October. Despite the protests, and actions (which may have been feigned) taken by the German headquarters, in March 1945 in the province of Modena alone there were still 3,000 “draft dodgers and deserters working for the Germans”, as stated in a report issued by the Ministry of the Armed Forces. In short, the Todt had become an organization which, thanks to the support of the German military authorities, could issue notices, recruit staff, decide who could serve in the army and who could instead avoid the draft by working as a civilian. Apparently for the Germans Italian workers were the the priority, not Italian soldiers. This priority favoured those youngsters, including many partisans, who saw working for the Todt as an excellent opportunity to avoid the brutaility of the civil war and to work near home without running too many risks. As regards working conditions, the fact that an enormous number of construction sites, factories and farms came under the aegis of the Todt makes it difficiult to give a clear answer to the question. 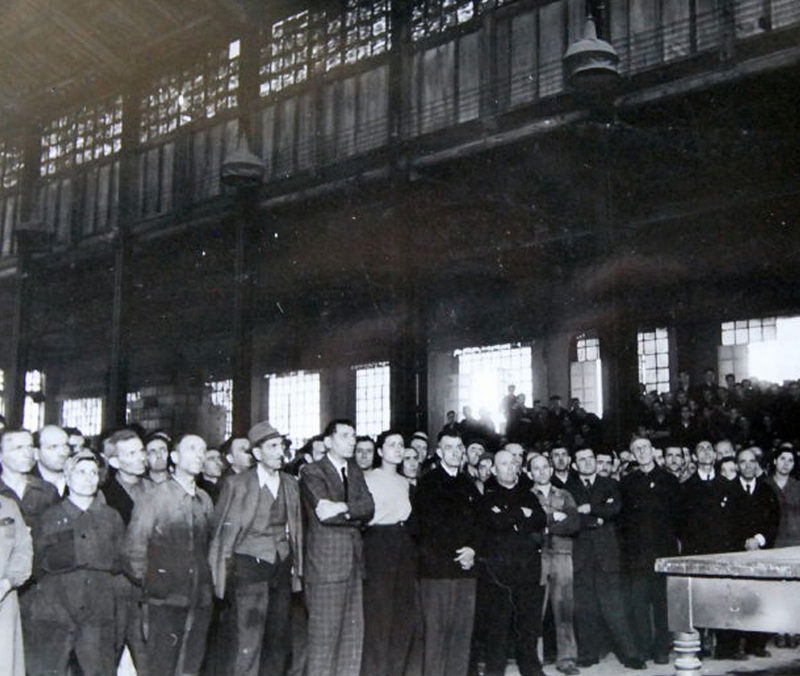 The 15,000 workers in the province of Genoa were likely to have been metal workers who simply worked in local companies that the Germans described as “protected”, ie working for the economic interests of the occupying forces. The conditions were the same as in all Italian factories working for the Germans: harsh conditions, naturally, but without risks. The treatment of those workers who were engaged in the extremely exhausting excavation work of building fortifications near the front or in the Alps, and often found themselves without the clothing and equipment they needed, would have been very different. However, even this was apparently considered better than being sent to Germany as forced labour or being enrolled in the republican armed forces. The Todt proved a very effective system for the exploitation of forced labour, and made a fundamental contribution to the German war effort. Paolo Savenago, Le organizzazioni Todt e Poll in provincia di Vicenza, Cierre, Verona, 2003, p.33. Archivio Centrale dello Stato, Segreteria particolare del Capo della Polizia RSI, b.32. Lutz Klinkhammer, L’occupazione tedesca in Italia, Bollati Boringhieri, Torino, 1997, pp.147-148. Lutz Klinkhammer, L’occupazione tedesca in Italia, Bollati Boringhieri, Torino, 1997, p.147. Archivio Centrale dello Stato, Ministero dell’Interno RSI, Gabinetto, b.33. Archivio Centrale dello Stato, Segreteria particolare del Capo della Polizia RSI, b.40. Archivio Centrale dello Stato, Ministero dell’Interno RSI, Gabinetto, b.43. Archivio Centrale dello Stato, Ministero delle Forze armate RSI, Gabinetto, b.2.